Lip balms presented in this category are generally gifted during bridal showers and they are formulated using high value ingredients. 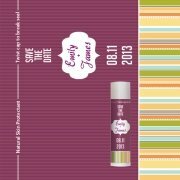 This bridal shower lip balm favors helps to bring smile on lips that make it to the event. It is definitely a perfect way to announce happiness and celebrate a lovely time with friends and family prior to wedding. Personalized lip balms with brides name or other details such as venue or thanking notes etc will be loved by guests. Our team will work closer with you for personalizing any lip balm presented here with information of your choice.